1. Download python for symbian , Install. 5. 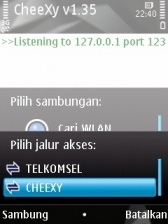 Open cheexy, Cheexy will open an Internet connection through port: 8000, minimized. valuable!!! the article is actually the best on this deserving topic. I fit in with your conclusions and will thirstily look forward to your future updates. Saying thanks will not just be enough, for the wonderful lucidity in your writing. jhantu hai tu.. Plz k chode. NetSpeedTest service is the most effective speed test tool. Net Speed Test is using secure data transfer test from your PC to our high speed network server. just want to ask...do my internet MB get used up faster after this proces? Videocon Telecom offers the LOWEST TARIFF of 25P/min for ALL LOCAL CALLS in Haryana. Considering the limited memory of our phone, I used to combining private browsing, screen app, boost, anti-virus, etc speeding up features together. LEO Privacy really good for laze person like me. lol! Hope it can help you.